Welcome to First Line Fridays! The day we grab the book closest to us and share the first line. Join the fun and discover your next read! Today I’m featuring, A Daring Venture by Elizabeth Camden. Don’t you just love Fridays? I don’t know about you, but I can often squeeze in a little more reading on the weekends than I can during the week. I doubt I’ll be doing much reading this weekend, though. I’m headed for the 2019 Mount Hermon Christian Writers Conference! KRC Members can look for my spring newsletter with all my exciting updates (and, of course, the latest giveaways and book deals) to land in their inbox shortly after I return. If you aren’t yet a KRC Member, be sure to click the link below to sign up! 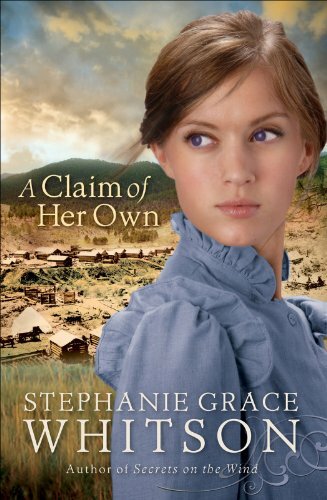 Today I’m featuring, A Claim of Her Own by Stephanie Grace Whitson. This is one of those books you remember vividly even years later. Walking down the main street in Deadwood is like stepping onto hell’s front porch. Doesn’t that line make you excited to keep reading? I have been a fan of Pepper Basham’s writing since I read her debut novel, The Thornbearer and have read every book she has written since then. The character of Julia immediately intrigued me (although I have to disagree with her assessment of baths & pregnancy – I couldn’t have survived my pregnancies without those long soaks!) and I wanted to know more about her. I wanted to know how she’d gotten into her situation and how she was going to handle it now that she was there. Julia Jenkins – As I mentioned, Julia intrigued me at the start and she continued to hold my interest throughout the book. This is a woman with a quiet strength. The type of person you might not notice when you first enter a room, but whose strength and courage will astound you in times of trial. Most importantly, her faith is a thing of incredible beauty. Henry Wright – Oh how I love the chuckle Pepper gave me by giving Julia a “Mr. Wright.” Name aside, however, the character of Henry had to grow on me a bit. It wasn’t that I initially disliked him — I liked him right away — but he is so unique and his introversion is expressed in such an unusual manner that it did take some getting used to. In the end, my heart was completely won over by this one-of-a-kind, heart-meltingly loyal, and inspiringly selfless man. Amelia Dawn aka Aunt Millie – Julia’s recently deceased aunt is a source of mystery. A recluse in her old age, Amelia’s life before settling near Pleasant Gap is mostly unknown, despite Julia’s close relationship with her in recent years. Throughout the novel, Julia and Henry attempt to uncover Amelia’s secrets and I have to tell you, what they find is worth the search. Wes Harrison – Hero of the first book in this series, Wes is back in this book as the longtime boyfriend of Eisley and best friend of Henry. As with Eisley, his role is important, but not large in this book. Nate Jenkins – Father of Julia Jenkins, he is naturally protective of his daughter – even more so given her recent experiences – and he provokes some very entertaining and also very touching scenes in this novel. Fair warning: one of his scenes had me wiping moisture from my eyes and swallowing a lump in my throat. While not perfect, in many ways, he’s what dads should be. Not only were the hero and heroine of this book engaging, but the secondary characters were equally so. Pepper has done an excellent job developing the Jenkins family and I am looking forward to reading more stories featuring them. Henry’s family was refreshingly dysfunctional and I loved the surprising and compassionate way in which Pepper portrayed them. This book made me laugh out loud, shake my head, and wipe away pesky tears. I’ll begin by stating that this story captured first my interest and then my heart. However, I admit to not being as big of a fan of the big duet scene between the two main characters which I have read other reviewers rave about. To be clear: I didn’t dislike the scene. I just didn’t love it. I think my lack of enthusiasm can be attributed to my general lack of passion for the lingo of music. While I love listening to it, I am neither a player nor a student of that particular art. Therefore, I think some of the subtler nuances of that side of the story – the various musical vocabulary and phrasing sprinkled throughout the story – may have escaped me. Nonetheless, I never felt that I was in any way lost or confused about what was going on. Furthermore, there were many, many other things to delight me in this story. I completely related to many of the experiences Julia had in regards to her pregnancy, and, in some ways, I could relate to Henry’s need for moments of solitude. The love which grows between the two main characters is something I couldn’t help but feel in a very real way. The unexpected twists Pepper created in this story kept me very happy as a reader, and as always, her literary gift with words was a music all its own. Wonderful and full of small twists you didn’t see coming. This ending is sure to leave you grinning. Have you read any of the books in the Pleasant Gap series? What do you think it means to be courageous? Note: I received a free copy of this book from the author, but was NOT required to write a positive review. You may read my full disclosure of materials HERE. I actually met Tamera in the one place they tell you not to bother the faculty: the bathroom. LOL To be fair, it’s not like I stalked her in there. I just happened to come out of the stall just as she was finishing washing her hands. While I was washing my hands, I said, “Well, this is an awkward place to meet, but I have to tell you that I think your books are awesome.” Or something very similar to that. She very graciously thanked me for my compliments and that was it. Not much of a conversation since we were both hurrying to the next class, but a little while later I was able to sit in on a class where she was part of the panel discussing “Writing in Community.” It was great to hear her thoughts on the subject along with those of the others on the panel (many of whom I was also silently fan-girling over: Deborah Rainey, Jody Hedlund, Lynette Eason, Lynn Blackburn, Karen Witemeyer). What I didn’t know about Tamera was that Deborah Rainey is her critique partner. The banter between those two kept the panel discussion fun. Books by Tamera: A Note Yet Unsung (2018 Carol Award winner & 2017 Christy Award Winner & part of the Belmont Mansion series), The Inheritance (2010 RITA Award winner), From a Distance (One of my personal favorites & 2009 Christy Award Winner & part of the Timber Ridge Reflections series). Find more of her books here! After reviewing a few of Pepper’s books for the blog, I’ve had the opportunity to begin a friendship with this wonderful woman via email. Getting to finally meet her in person was such a pleasure. She immediately recognized me when we spotted each other in the huge crowd and gave me a hug. She is just as friendly and genuine in person as you could hope for. Books by Pepper: The Penned in Time series (the books that made me fall in love with her writing), the Mitchell’s Crossroads series (how can you not love a great reimagining of Pygmalion? ), and Jane by the Book (featuring a hero like no other). Find more books by Pepper here! Mary Connealy is a Carol Award winner and a Rita and Christy and IRCC Award Finalist. I have been a fan of her writing for so long, I can’t remember when I started reading her books. I only know if there’s a book of hers that I haven’t read (and I’m not sure there is), it’s only because I haven’t been able to get my hands on it yet. It was the first day of the conference when I was speaking to Carrie Schmidt (another online friend I was thrilled to meet in person) when Mary’s name came up and I mentioned what a huge fan I was and that I hadn’t yet had the pleasure of meeting her. Carrie, dear heart that she is, immediately got up and went to pull Mary from the crowd and bring her over to introduce us. I’m not sure I managed a very fascinating conversation considering my brain just kept repeating, “No way. No way. I can’t believe I’m actually meeting her!” LOL But I do recall that she asked what genre I wrote in and I managed to get some intelligible words out . . . I think. What I didn’t know about Mary was her willingness to help other authors. Later that night there was an event at which nervous authors were invited to come practice their pitches before facing agents and editors in appointments on the days to follow. Carrie Schmidt was one of the hosts so I stopped by to see how it was going and Mary was there, along with other experienced authors who’d volunteered to listen to pitches. Books by Mary: The Cimarron Legacy series (don’t miss the novella prequel! ), the Wild at Heart series, & The Kincaid Brides series, and Garrison’s Law is her fun new contemporary series that I’m loving. Find more of her books here! You know what’s really fun? Having a casual conversation with another author and suddenly realizing you just downloaded their debut novel the night before! That’s what happened when I met Emily Conrad at the conference. If you haven’t heard of her debut novel, Justice, I definitely recommend you take a minute to check it out. What I didn’t know about Emily was … well I already covered that, didn’t I? 😉 I had no idea the author whose book I’d just purchased would be standing in front of me the very next day. Find Emily’s debut novel here. What I didn’t know about Sarah was that she is a serious outliner when it comes to plotting. Some writers start with a basic idea, then just sit down and start writing. Others outline nearly everything that happens in their novels before writing a single word. Sarah falls into the latter category and it can take her about three months to complete an outline, but then her actual writing goes pretty fast. Books by Sarah: The Sunrise at Normandy series, the Waves of Freedom series, the Wings of the Nightingale series. Find more books by Sarah here! I just happened to cross paths with Carrie Turansky after checking in at registration for the conference. She was very sweet when I stopped her to tell her how much I loved her writing. We had a couple more opportunities to talk during the conference and I found her to be a very kind person. What I didn’t know about Carrie was that she is not only a fabulous author but a mentor as well. She was a finalist for this year’s Mentor of the Year Award. Books by Carrie: Shine Like the Dawn (My favorite! ), Waiting for His Return, and Across the Blue. Find more of her books here! I met Erica at the Pitch Practice session where she was helping listen to authors practicing their pitch. While I was there, Erica very kindly took the time to look over some of my writing and provide me with invaluable feedback. The fun part is that I knew her name was familiar but couldn’t bring to mind her titles (my brain was mush by then – almost 10pm). So when I returned to my hotel room, I searched her name and discovered that I had actually read many of her books. Better yet, I immediately downloaded her latest novella, A Perfect Christmas, which has only recently released as part of The Victorian Christmas Brides Collection and, despite the anchors weighing my lids, I had a very difficult time putting that book down! What I didn’t know about Erica was what a kind and helpful spirit she has. Books by Erica: A Perfect Christmas in The Victorian Christmas Brides Collection (Highly recommended! ), Prescription for Love in The First Love Forever Romance Collection, My Heart Belongs in Fort Bliss, Texas: Priscilla’s Reveille Find more books by Erica, here! What I didn’t know about Karen (besides her not having an assistant) is that her humor is just as witty in person and she is genuinely kind. She really cares about her readers. I also didn’t know that she has a lovely singing voice. Karen and Kristi were both members of the choir that sang for us at the ACFW Gala. Books by Karen: More than Meets the Eye (Laugh-out-loud-funny! ), Heart on the Line (picked as one of my Top 5 Heroes of 2017), and A Tailor-Made Bride (the first book I read by Karen). Find more of Karen’s books, here! Well, because it’s 2018 and I had to cut it off somewhere. Honestly, though, I could fill 30 blog posts talking about all the wonderful people I met at the conference. I told my mom that it was like an actress who’s still waiting tables walking into a room filled with all the A-list celebrities you can think of and discovering their all happy to meet you and willing to help you, AND they all love Jesus!!! Have you had the pleasure of meeting one of your favorite authors? Which Christian Fiction author would you most like to meet? From This Moment – Stella West dropped her entire life and knowingly placed herself in harm’s way to discover what happened to her deceased sister. Sons of Blackbird Mountain – Aven Norgaard showed incredible courage in her willingness to continue to hope despite her extremely difficult life and incredible love in her treatment of everyone around her. An Awakened Heart – Christine Pendleton defies social expectations in order to help those who’ve been outcast and oppressed at great personal sacrifice. A Song Unheard – Willa Forsythe is socially outcast and living a life of poverty, yet she places everything on the line – including her very life – to help someone she’s never even met. Three Words and a Kiss – A privileged upbringing isn’t enough for this bold young woman. Samantha Klein sees incredible needs and is compelled to act, again and again, regardless of personal cost. What do you think? Have you read any of these books? Who are your favorite heroines of 2018?